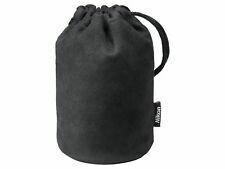 The CL-1018 is a soft pouch with a drawstring closure. Specifically designed for select NIKKOR lenses. Item model number: Lens Case CL-1018. Soft pouch with a drawstring closure. Size 18-200 mm f / 3.5 - 5.6 G ED VR II. Lens mount Nikon F. Focal length (wide angle side) 18 mm. F value (wide angle side) 1.4. Image stabilization There. Color black. Product weight 558 g. Battery included No. Features ?. Our Products are 100% Authentic. ☆Quantity last one. Country of Manufacture. ※Germany, France, Italy, Mongolia, SriLanka, Turkey, Nigeria and more.